Hey, you! Yeah you! Do you have some time and skills you'd like to dedicate to a purpose driven, start-up social enterprise? Then look no further, Real Talk is looking for volunteers! Since its inception in 2016, Real Talk has been moving from strength to strength, working on promoting authenticity and compassion around experiences of mental ill health. We've run loads of storytelling workshops and community mental health events and the impact of these has rippled out from Edinburgh and beyond. Up until this point, its mostly been our founder, Lily, working away behind the scenes. But we all know innovation never happens in isolation, so we need your help. At the moment there are 3 roles to fill that would be a huge asset to developing Real Talk in the future! 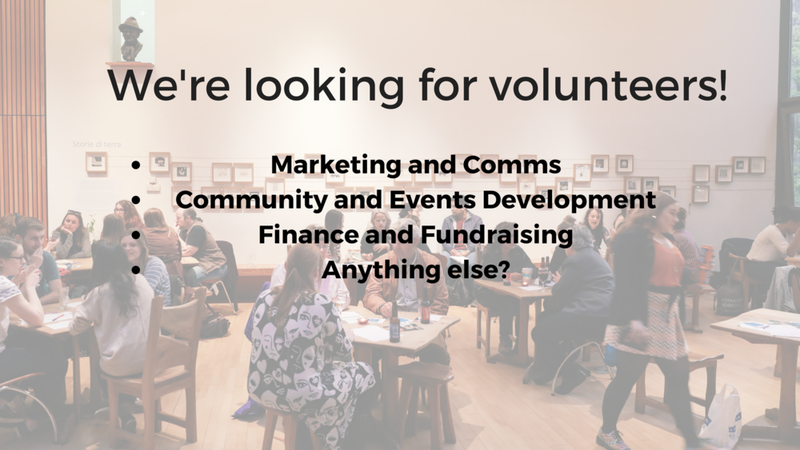 Our vision moving forward includes expanding our events programme into new cities, crafting training courses in person and online, and developing an ambassador programme (and more) for our wonderful community. If you're passionate about positive mental health, about the power creativity has in promoting wellbeing and want to work collaboratively in a small team to develop Real Talk, please get in touch. We're hoping to find people who can dedicate 3-5 hours a week for at least 3 months (though there is definitely flexibility in this). You can find the role descriptions here. However, if the roles suggested don't float your boat, fill out the form below anyway and let us know what you can contribute that we can't live without! If you have any questions or would like to chat the roles through a bit more, please email Lily at hello@realtalkproject.org.